What a title hugh LOL!! One look at my card though and you may agree with me! This lil' guy is for the Inspiration Challenge on SCS and it uses the bonus sketch from 2 Sketches 4 You....I love it! I had a lot of fun stamping my very vanilla paper to try and coordinate with the dp I used. I do believe I accomplished this without any problems. My punched out flowers looked a bit bare and a brad would've been too small so I went for the bling instead. I think it adds a nice touch just like my lil' crooked dots along the scalloped edge!! Like I said, FUN card!!!!! Hair appt. went great and I feel like a new woman!! Only problem is I asked her not to do anything fancy and I walked out with a head full of curls. As I type this; I'm constantly shaking my head in hopes that they'll loosen and fall....I know; I'm pathetic ROFLOL!!!!! Thanks so much for stopping by and I hope the rest of your day is great! What a gorgeous card ~ love the color palette! Fabulous take on the 2s4y sketch this week!! Love those striking colors. Another beautiful card. Thanks for inspiring me to do more challenges. Jackie this is one of my fav color combinations. Love the fun feel of this card! Love the red, black and white together. Well, you stamping must be really great because I can't tell which is the dp and which is your stamped paper. Fun! This is a WOW card! Love the red and black combo. This is such a pretty card! I love cards made with red, black and white/very vanilla color combo. Love it and I hope you are having a nice Saturday! Gorgeous card, I get so inspired every time I visit thought it was about time I let you know & say thank you. 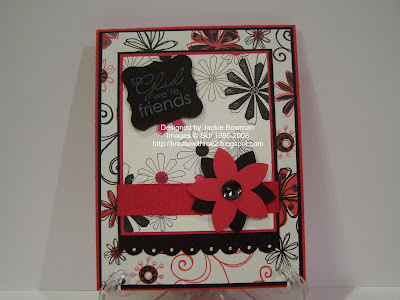 Oh, you know how I love black, red, and white together...this is so striking Jackie! Great Job. Love the use of the colours! Hope your curls fall soon lol. Oh, I love what you did with my sketch! The colors are wonderful and your stamping is perfect!